Melvin Lawrence De Fleur (born April 27, 1923 in Portland, Oregon) is a professor and scholar in the field of communications and Social Psychology. In 1954, University of Washington gave a Ph.D in Social psychology for his experimental study “Experimental studies of stimulus response relationships in leaflet communication” based on American Communities how information diffused by them. He taught very universities from 1954 to till today. Now he is working as a Professor and head in the Department of communication and Advertising and Public Relations in the University of Boston. The theory De fleur model of communication is expanded version of Shannon and weaver model of communication. And also based on the “Westley & Maclean model of communication” describes the circular process of communication with feedback from the receiver. Shannon and Weaver model is a one way communication and they explain the role of noise in the communication process. Westley & Maclean model is a two way communication and for first time they introduced the important component called “Linear Feedback” in the communication model. De fleur combine these two models and creates new one called “De Fleur Model of Communication”. De Fleur simply expands the Shannon & weaver model of communication by inserting the Mass Media device and suggested the communication process is circular as well as it gives possible two way feedback. In this whole communication process, noise may occur at any stages. 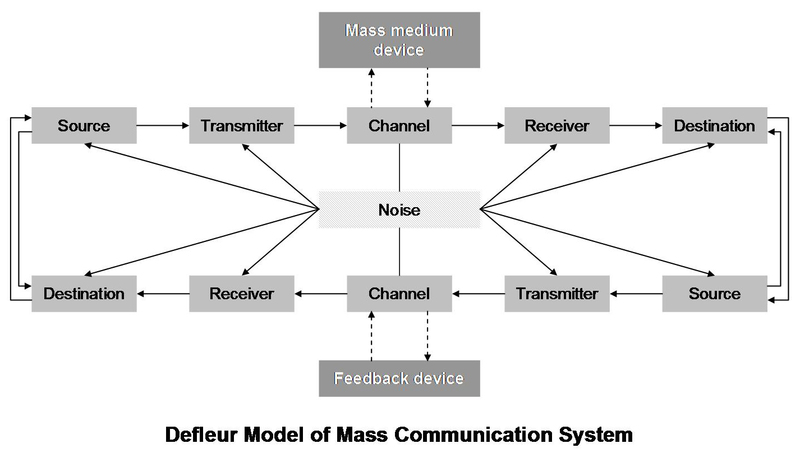 Defleur pictures the source, transmitter, receiver and destination as separate phases of mass communication. Defleur’s another important suggestion in this model is “Feedback Device”. This feedback device is helps to analyse the target audience (as separate from the receivers). Here, all these receivers are not considering as a target audience because the target audience will make some kind of feedback which will helps to find the target audience by using feedback device. One of the important aspect of the communication model is two way communication process which is recommended by Defleur. And also this model is the first one which introduce both two way feedback and targeted audience in the communication process. De Fleur’s model can be well explained with the help of advertisings. Say let’s assume source as the advertising strategy or simply the information about the product which the company intends to tell to its audience. This is then converted into message as ad film and then transmitted by a mass communicating channel. At the other end the receiver (TV set or radio) decodes the information as message and finally it is being transformed to the destination (the target audience). Now comes the feedback aspect. The feedback acts as a message – an information source and the same process continues where the message reaches back the advertising company. (Feedback may happen through emails, social networks). Through feedback, the company can know whether their intended message has reached the target audience and if not they can modify their message and once again involve in communication process. Thanks, this helped me out a lot. Pauline ,I can translate it to you in Swahili. Finally understood the model! Nice work guys, once again! how to understand the NOISE in this thoery? superb full of relevant information. Thank you very much for your nicely explanation of this model.